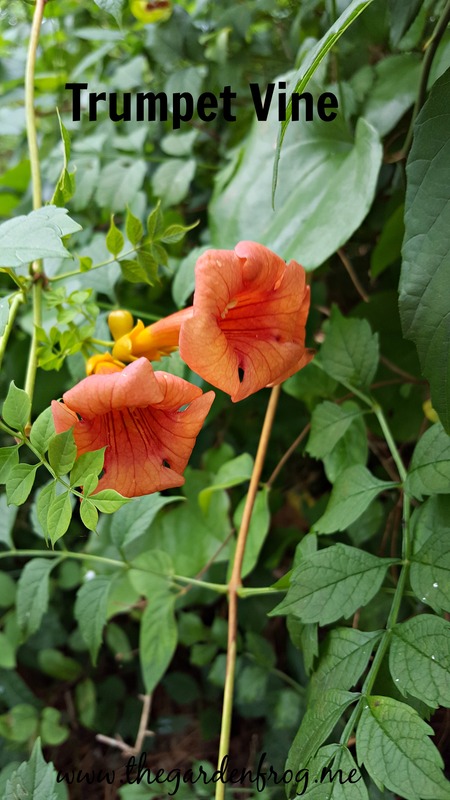 From June through September, the orange to red almost 3″ long trumpet shaped flowers of this native vine supply food for the hummingbirds. It is a vine used very often for pergolas and arbors because of its fast growth and pretty clusters of bright orange/red flowers. The Trumpet Vine grows in zones 4-9 will spread by seed, underground runners, and suckers from the base of the main plant. The fast growth of this Southeastern U.S. native will keep any gardener busy chopping and cutting back the vines and runners to keep it in its place. The Trumpet Vine has its place in the wild where it can grow and reach 50’s from its base. I caution anyone who plants this aggressive vine near any ornamental trees or other plants that could get choked by the twining of the vines. This is not a vine to plant and leave! If you choose to plant it, then take caution in where you plant it and take steps to collect seed pods before they open (because the pods will dry and open to reveal winged seeds that get carried away by the wind). 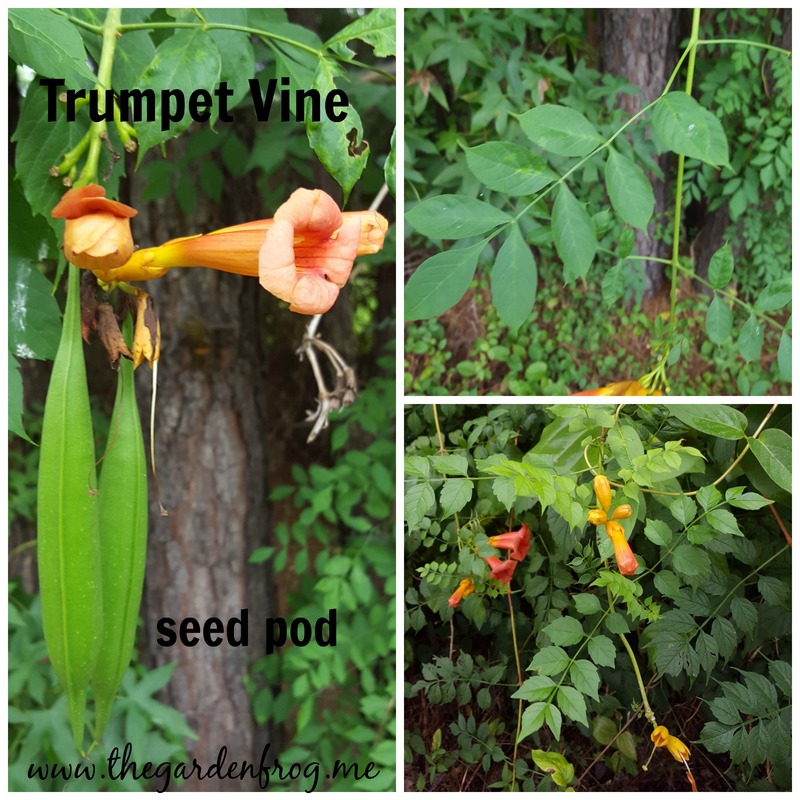 You could spend time trenching around the base of the Trumpet Vine every couple weeks to cut of any underground runners and pruning the vines to keep them in check. There are ways that you can keep it in check but it will require time and energy. The Trumpet Vine will grows and blooms best in full sun where it will bloom profusely. It grows in the woods under the canopies of mighty Oak trees. However, there may not be any blooms. It adapts to any soil and will grow well in dry areas. 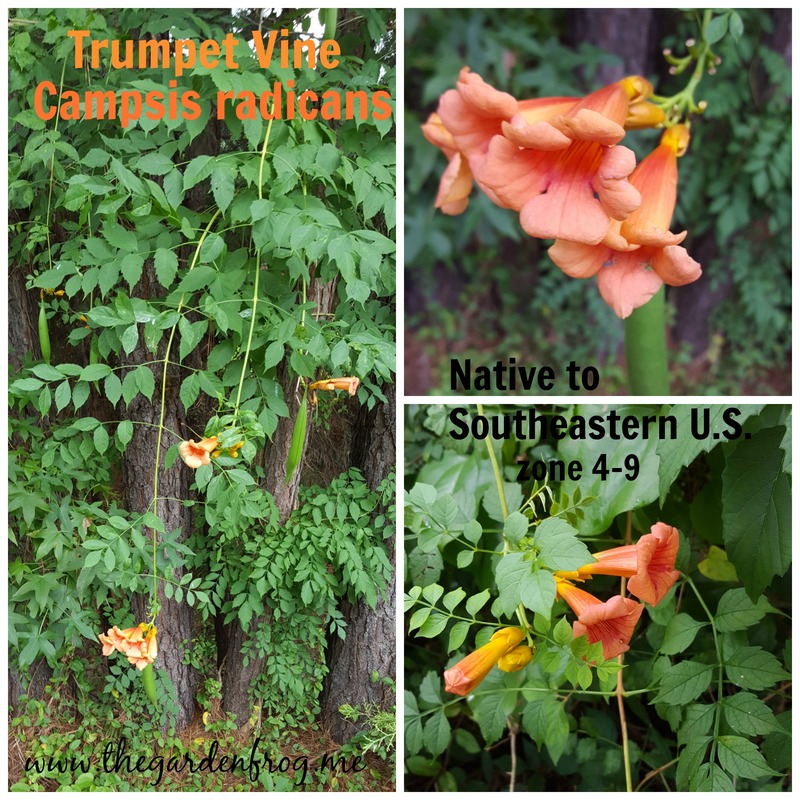 The Trumpet Vine grows rather well here in the red clay soil of Virginia (zone 7). So if you fall in love with the idea of covering a pergola with a Trumpet Vine, keep in mind this is a vine that gets heavy as it twines itself on the structure. It will take a bit of extra time to keep this vine in check and Trumpet Vines will grow along the ground or 50′ up an Oak Tree. I confess, I would plant this along a fence line or on an old barn to attract the hummingbirds and take my chances with its wild and untamed growth. Thanks for stopping by and remember gardening is about working with nature. I have orange too.haven’t seen yellow in years. Best advice is to look for garden groups and ask members. Good luck.